The world’s population is constantly growing, and with it the demand for water, shelter, better quality of life — and, above all, food. We consume so much of it that all the farmland required to feed humanity would create an area almost the size of North America if put together. Farming creates its own set of problems. As farms proliferate and expand, they push against ever-shrinking wildlife habitats. Since many new fields used to be dense forests, deforestation is a major concern because it tips the natural balance, resulting in landslides, extinction of animal species, animal attacks on humans, and more. Nemo’s Garden is a project that uses underwater transparent bubbles (biospheres) that house edible plants. The idea is to expand agricultural efforts in areas where surface-farming would be difficult due to economical, geographical or natural factors. The system is almost fully self-sustainable. No pests can wander in, nor can disease spores be brought in by the wind. Fresh water is available 24/7 through desalination. All biospheres have a dome-like structure where only the bottom part is immersed in seawater. This design ensures much-needed fresh water for the topmost area with plants: When salt water evaporates within the biosphere, it condenses on top of the dome, then trickles back down, salt-free, and nurtures the herbs and vegetables. As for sunlight, domes are transparent, and the sun’s rays increase the internal temperature. Before the project can reach commercial sustainability, more testing is needed to determine the optimal setup of depth, plant diversity, biosphere conditions and the possible use of algae as a fertilizer (instead of liquid fertilizer produced on the surface that is currently used). 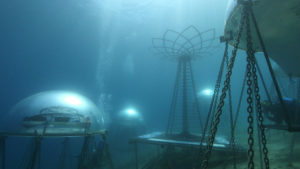 This would mean fewer maintenance trips by divers and would render the pods even easier to maintain and reap. Ocean Reef Group, the company behind Nemo’s Garden, has seven pods of different sizes containing various types of plants, ranging from oak to turnip tops, that it has plopped in the Mediterranean off the coast of Noli, Italy. Nemo’s Garden does seem awesome, but at its current state and capacity, it won’t solve the world’s food problems. Bren Smith, an American entrepreneur, has a different solution. He calls it “3D ocean farming.” A 3D ocean farm is basically a vertical underwater garden. Kelp and mussels grow on ropes floating above oyster and clam cages located at the bottom of the sea. This simple setup is capable of truly impressive yields. By using the entire food column, the farm, located in the Long Island Sound, has the capacity to grow 20 tons of sea vegetables and 500,000 shellfish per acre every year. But what would be on the menu? Kelp, for the most part. It protects oceans from turning more acidic; it also absorbs carbon, nitrogen and phosphorous from the water. This makes waters rich with kelp safe for shellfish and some other aquatic creatures, such as crabs and shrimp. In an article published on Popular Science’s website, Bren admits it’s difficult to sell the idea of kelp as food, mainly because it’s not particularly tasty. He even went as far as hiring professional chefs, tasking them with creating kelp-based dishes. Aside from growing food and supplying biofuel, 3D ocean farms are home to a wide variety of marine and bird species. Kelp soaks up more carbon than any land-based plant, while its nitrogen-absorbing properties provide safe harbor from algae blooms and resulting low-oxygen dead zones that form after their decomposition.